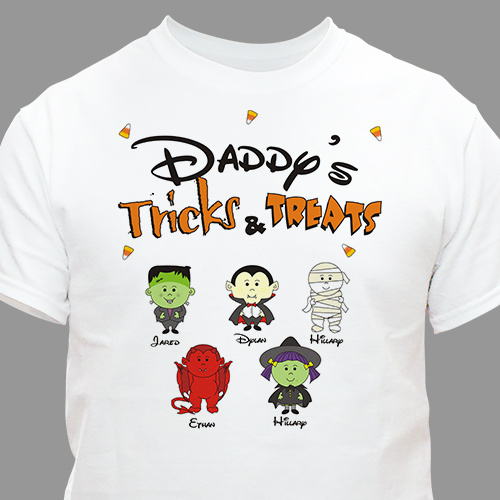 Create a fun and bright colored Halloween T-shirt for your Dad, Grandfather, Mom or Grandmother with our Trick and Treats Character Personalized Halloween Shirts. These fun and cool looking Halloween monsters look great and make a perfect Trick or Treating shirt to wear with the kids. Your Personalized Tricks and Treats T-shirt is available on our premium white 100% cotton t shirt, machine washable in adult sizes S-3XL. Includes FREE Personalization! Personalize your Halloween T-shirt with any title and up to 12 names. Please choose from 6 characters for each name. LOVE MY SHIRTS THEY ARE AWESOME! Additional Details Personalized Halloween Gifts from GiftsForYouNow.com feature fine quality materials and great Halloween designs. We feature one-of-a-kind Halloween creations made especially for you. So whether you are looking for a Personalized Monster T-shirt or a Scary Doormat to greet trick or treaters, GiftsForYouNow.com has what you need.